Biography | Ben Thomas plays the vibes and bandoneon, and composes music. In demand as a performer and educator, Ben Thomas combines an energetic performance technique with a distinctive compositional style. 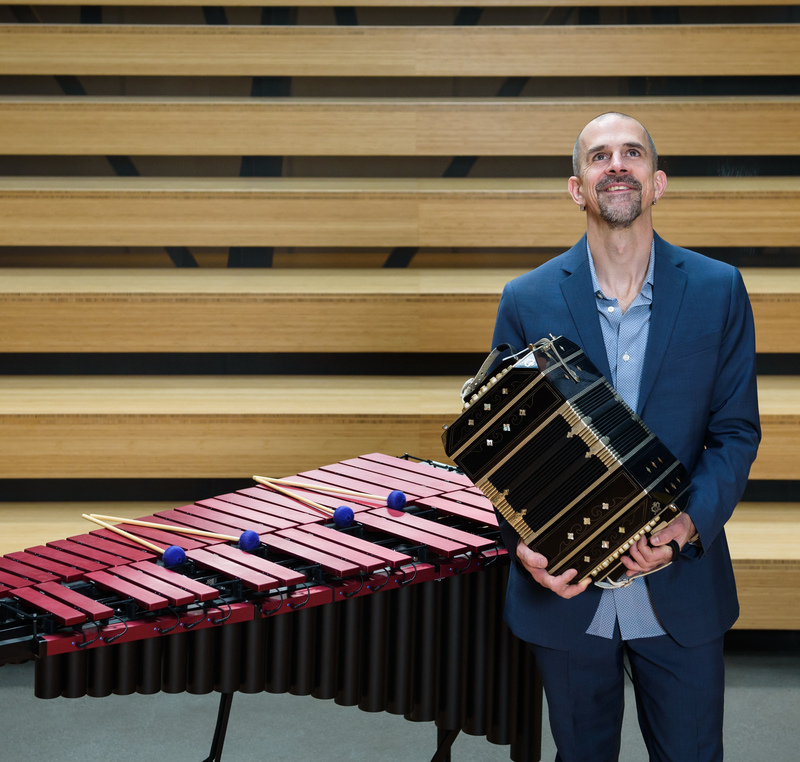 As a vibraphonist, percussionist, and bandoneon player, he can be found playing tango, jazz, chamber music and Latin jazz throughout the Northwest. Ben has released four albums of original compositions on Origin Records as a leader or co-leader, including “The Madman’s Difference”, “The Mystagogue”, and “Triskaidekaphobia”. His most recent CD, “Yet What Is Any Ocean…”, was declared “an outstanding album with some interesting compositions and performances alike” by allmusic.com. In addition to leading tango and Latin jazz groups, Ben co-leads TORCH, a chamber group dedicated to both 20th century music and original compositions. Since 2005, Ben has been a member of Brazilian pianist/composer Jovino Santos Neto’s Quinteto. Their most recent album is “Current” on the Adventure Music label. Over the years, Ben has performed at the Stowe Tango Music Festival, Bumbershoot Arts Festival, Ballard Jazz Festival, Earshot Jazz Festival, Detroit-Montreaux Jazz Festival, Issaquah Jazz Festival, Anacortes Arts Festival, Ellensburg Jazz in the Valley Festival, Tacoma Maritime Festival, Bellingham Art of Jazz Series, and the Juneau Jazz and Classics Festival. Ben has composed for chamber groups, big bands, jazz combos, dance and theater. Well respected as an educator, Ben is the head of the Music Department at Highline College, where he teaches music theory, percussion, and piano. As an adjunct at Cornish College of the Arts, he has taught percussion, jazz history, and the Tango Ensemble.Working as a clinician/educator, Ben has taught clinics and masterclasses at colleges across the country. He is an Artist-Endorser for Malletech Instruments and for A. Putnam Mallets. Dr. Ben Thomas completed his Doctor of Musical Art in Percussion Performance at the University of Washington in 2007. His dissertation was on the development of Cal Tjader’s early Latin Jazz vibraphone style. Ben received his Master of Music with Honors in Improvisation from the University of Michigan in 1994. While in graduate school, he directed the University of Michigan’s Jazz Composers Orchestra and worked with composer Stephen Rush. Ben also graduated from Swarthmore College, where he majored in mathematics and music. Well respected as an educator, Ben is the head of the Music Department at Highline College, where he teaches music theory, percussion, and piano. As an adjunct at Cornish College of the Arts, he has taught percussion, jazz history, and the Tango Ensemble.Working as a clinician/educator, Ben has taught clinics and masterclasses at colleges across the country. He is an Artist-Endorser for Malletech Instruments and for A. Putnam Mallets.